We recently received an email from a long-time customer about a unique way of viewing effects of magnetic fields. He found it on instructables, shown as something relatively easy to build. We found it so interesting, we just had to build one ourselves! 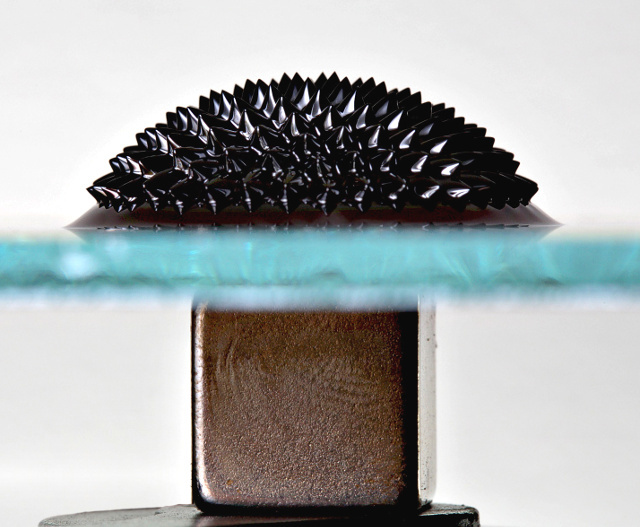 Ferrofluid on top of a sheet of glass, reacting to a neodymium magnet underneath. From the Wikipedia article about Ferrofluid, attribution. Ferrofluid is an oily substance that contains very tiny ferromagnetic particles that make it attractive to magnets. The particles are bits of something that contain iron, typically magnetite or hematite. Each particle is coated with a surfactant to prevent clumping of the particles. Despite the recent tendency to label everything small with the prefix “nano,” these particles truly are nanotechnology. The average particle size is about 10 nanometers. That’s small! A sheet of common office paper is about 0.003” thick. That's 0.076mm or 76,200 nanometers. That’s also about the diameter of a human hair. It would take roughly 7,600 of these particles lined up in a row to equal this thickness. Wow, that's small! 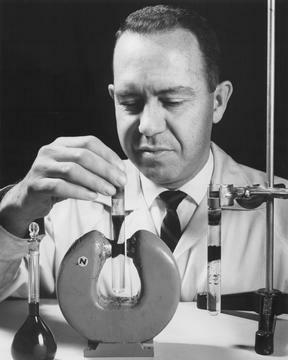 Solomon Steve Papell, inventor of Ferrofluid. Ferrofluid was originally invented in the 1960s by Solomon Steve Papell, an engineer at NASA. It was originally an idea for how to draw liquid rocket fuel towards a combustion chamber in a weightless environment. How could you get a blob of liquid fuel sitting in the middle of a tank to move towards the tank exit at one end? Magnets! The original patent was awarded in 1965: 3215572, Low Viscosity Magnetic Fluid Obtained by the Colloidal Suspension of Magnetic Particles. Since then, others have developed this fluid with newer materials that make it more useful today. Ferrofluid can be found in audio speakers, helping them perform better; hard drives, forming a seal around the spinning shaft; some auto shock absorbers, allowing them to be more compact and efficient, and many other everyday items. How is this magnetic field viewing device made? A mixture of liquid containing about one-quarter Ferrofluid and three-quarters WD-40 (or mineral oil) is set between two layers of glass. We used two sheets of 8” x 10” glass purchased from the local hardware store. We found that once we squished the air bubbles out by pressing down with our fingers, the layer of liquid was too thin to see the effect very well. To control the thickness, we framed an outline on one sheet of glass with Scotch tape, ensuring that a 0.002” thick gap would exist between the two sheets of glass. This allowed the layer of fluid to be thicker. Getting the bubbles out of the fluid turned out to be rather fun. The instructable showed someone pressing them out towards the sides with their fingers. Since this resulted in too much loss of fluid for us, we slowly pushed the bubbles out with a magnet. This was a little tedious, but oddly mesmerizing. After taping around the edges of the glass with packing tape to seal it, we set the assembly over a one-meter long strip of bright, white, LED lights. We initially placed it over a single powerful light, but it didn’t show the multi-line effect we were hoping for. You need the many bright point sources of light to see this effect. The video below shows some testing of the device by placing various neodymium magnets on top. What are we looking at here? What are those lines, exactly? 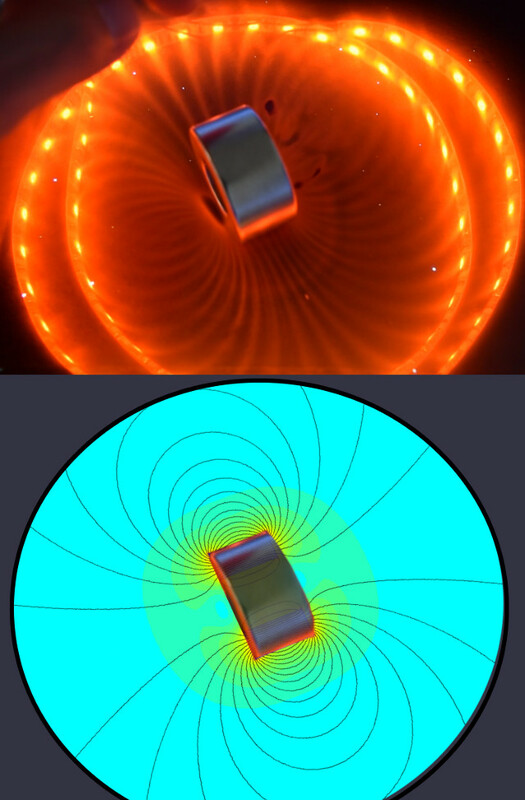 The lines we see using this ferrocell are not magnetic field lines. They don’t look like the black lines of flux shown in diagrams like the ones on our site. Let’s first take a step back: What are magnetic field lines? 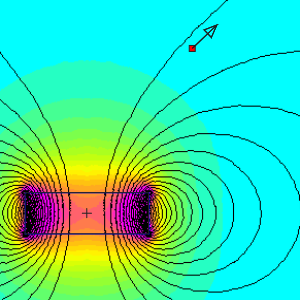 Consider some point in space near a neodymium magnet. The magnetic field at that point has both a strength and a direction. The black lines of flux on the diagram at right depict that direction. At any point in space, the direction is parallel to those lines. The diagram at right taken from the K&J Magnetic Field Calculator shows a 114 gauss field strength pointing up and to the right, at a point near a D62 disc magnet. Here's another way to describe what those black field lines represent: Imagine yourself standing somewhere on one pole of a magnet, only you’re a very tiny, microscopic size, standing on a big magnet. You’re holding a compass so you always know the field’s direction. Starting from the surface of the magnet, you look down at your compass, see which way it’s pointing. Take a small step in that direction. Then you repeat this process. Take a glance at the compass, and take a step in that direction. Do this over and over again, on a long walk around the magnet. The black lines of flux are tracings of possible paths you would follow with these instructions. What are the lines of light in this DIY Ferrocell? If they’re not lines of flux, what are they showing? The answer seems to be a bit more complicated. As if understanding magnetism wasn’t complex enough, this device adds some crazy optical effects through a fluid. There’s something going on with polarization of the light and how it gets scattered by the nano-sized particles in ferrofluid. We didn’t quite understand 100% of what we read about it, but it seems that some of the effects aren’t yet completely understood. Studies are ongoing. Each visible line appears as a path of light that comes from each point light source and travels along the path of least potential. We’re not sure what that all means, but it sure does look interesting! In the adjacent pictures, the upper photo shows the device in action. The lower picture is an analytical depiction of the field strength and direction. It's clear that the lines are not showing the same things in the same way. That instructable we mentioned isn’t the original source of this interesting invention. Its roots actually come from an inventive guy named Timm Vanderelli who was looking for a way to observe magnetic fields in some other work he was doing back in 2005. He has a patent for the device. There’s actually a lot more interesting things and uses for such a device, some of which go way over our heads! 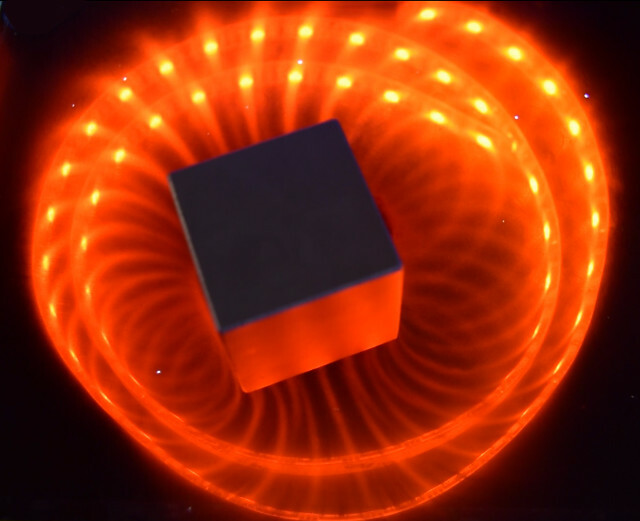 The way we’ve shown how it can react to a magnet's field is just the tip of the iceberg. K&J Magnetics does not sell Ferrofluid or Ferrocell devices like the one shown here. We’ve written about it here only because it seemed interesting for folks who like to experiment with neodymium magnets. That's us! 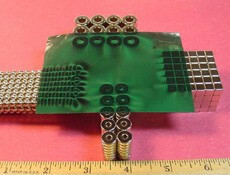 If you need a ready-made device like this, check out the inventor’s site. We’re here to provide the magnets. Our magnetic viewing film is another, less messy tool for visualizing magnetic fields. It’s also not the same as a magnetic field depiction, but it’s a handy field visualization aid. We’ve used this film in past articles about Halbach Arrays, Remagnetizing Fridge Magnets and Eddy Currents.